The bilateral Media Enabled Musketeers project teaches people with disabilities how to use journalism to talk about their lives. Even as political relations between the U.S. and Russia reach lows not seen since the Cold War, joint social and cultural projects continue. The Media Enabled Musketeers, part of the U.S.-Russia Social Expertise Exchange, presented their first festival of short films in Moscow on Sept. 19. The goal of Media Enabled Musketeers is to train people with disabilities to tell stories about their lives through short documentaries. The project unites professional journalists and film directors with people with disabilities. 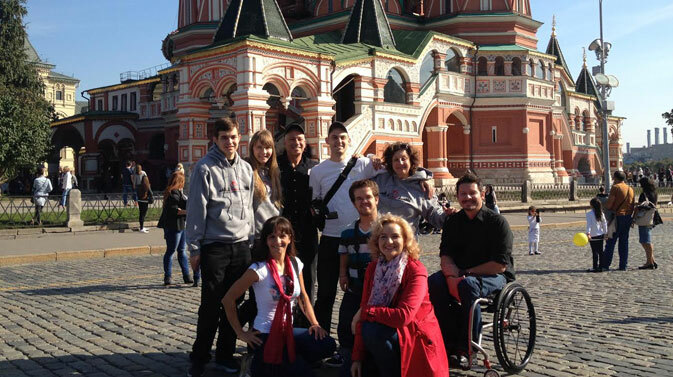 In addition to learning journalism skills and making films, the partners in the project, which include the Journalism Advancement and Support Center in Moscow and the Downtown Community Television Center in Manhattan, conduct community training seminars on disability sensitivity. The initiative received funding from the U.S.-Russia Peer-to-Peer Dialogue Program, which is funded by the State Department, the Eurasia Foundation, the U.S. Embassy in Moscow, Sony and private donors, including one of Russia’s best-known hockey stars, Vyshevslav Fetisov, who helped purchase cameras. “We asked here in Russia, who would like to work with us?” said Alpert. “We got no reaction in Moscow, but TV channels in Sergiev Posad (a Moscow Region town about 40 miles outside the city) and Krasnoyarsk (in Siberia, 4,000 miles east of Moscow) became very excited about the project,” Alpert said. In January 2014, Alpert took part in two training sessions for local journalists in those cities. Jonathan Novick, who made a short documentary called “Don’t Look Down on Me” about his life in New York with dwarfism, participated in the program from the American side and presented the American participants in the project at the event on Sept. 19. The 13 films shown in the festival were divided into several categories: little people, people with autism, visually impaired and deaf people, sports and disability in mid-life. The creators of the films addressed different issues in their everyday lives, such as choosing a career, taking care of a sick baby and falling in love. After the screenings, American and Russian participants were able to meet one another for the first time – during the course of the project, they communicated with each other online. Mariam Magomedova from Moscow spoke for the Russian group: “I’ve heard about this program from Jon (Alpert), who I knew for long time through the American Cultural Center [in Moscow]. We went to a workshop in Sergiev Posad, and he showed us how to work with the camera. Karina Chupina hold a workshop on understanding disability imagery in the media and common mistakes that journalists or people working with disabilities make,” said Mariam, who made a film about living with cerebral palsy. On Oct. 17 this unique collection of films will be shown at HBO’s theater in New York, and later some of them will be broadcasted on local public television stations.